July 27, 2018 — Pyroclastic flow – it’s a wall of hot ash, gas and volcanic matter created during a volcanic eruption that can get hotter than 1,800 degrees Fahrenheit, and can top out at speeds faster than 400 mph. When Mount Vesuvius erupted in A.D. 79, it was a pyroclastic flow that killed thousands; many caught sleeping in their beds. When Volcan de Fuego erupted in Guatemala in June, it created a pyroclastic flow that killed more than 100 and affected 1.7 million people. The Guatemalan government exerted a herculean effort to treat thousands of wounded and evacuate thousands more. Once the immediate emergency had been dealt with, the government then turned to caring for those who had been displaced by the volcano’s destruction. U.S. Marines and sailors with Marine Detachment-Southern Partnership Station were deployed aboard the USS Gunston Hall (LSD 44), en route to support engineering projects as part of Special Purpose Marine Air-Ground Task Force – Southern Command in Central America. They received the order to support the Guatemalans, and in short order had flown from the ship to Guatemala City, Guatemala, to make their way to Escuintla. They have been working with the Guatemalan Army Corps of Engineers to build over 100 shelters since they arrived two weeks ago. In the two weeks they’ve been working in Escuintla, the Marines have integrated seamlessly with the Guatemalans. There isn’t a single part of the humanitarian assistance project that hasn’t been touched by service members from both countries. The detachment is comprised almost entirely of reservists from units spread across the U.S. They run the gamut of military occupational specialties, from combat engineers and heavy equipment operators to water support and electrical systems technicians. 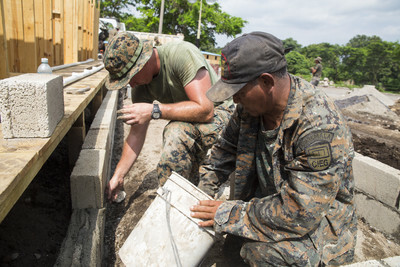 The mission called for all of them to swing hammers, shovel dirt and mix cement by hand, so a lot of the Marines had to learn about construction on the fly. Beyond the diverse MOSs the detachment brings to the table, each Marine and sailor brings the knowledge and experience they’ve acquired in their civilian life. Many of those experiences can be directly applied to the humanitarian project in Escuintla, according to Andrews. The Marines are following the lead of the Guatemalan soldiers, and using their methods and equipment to accomplish the mission. In the sweltering heat of the Guatemalan coast, they’re mixing cement and digging ditches by hand. It’s hard work, but the Marines enjoy the challenge. For their part, the Guatemalans are happy to have the extra hands to help with the heavy lifting. With the extra manpower the Marines provide, the time it takes to put a structure up has been cut in half. The Marines are also happy to be a part of the project, and have become fast friends with their Guatemalan counterparts. In typical fashion, patches, knives, uniform items and even military rations have traded hands between service members from both countries. But beyond just the camaraderie being built with new friends, the Marines recognize the positive impact their work in Escuintla will have on the people of Guatemala.